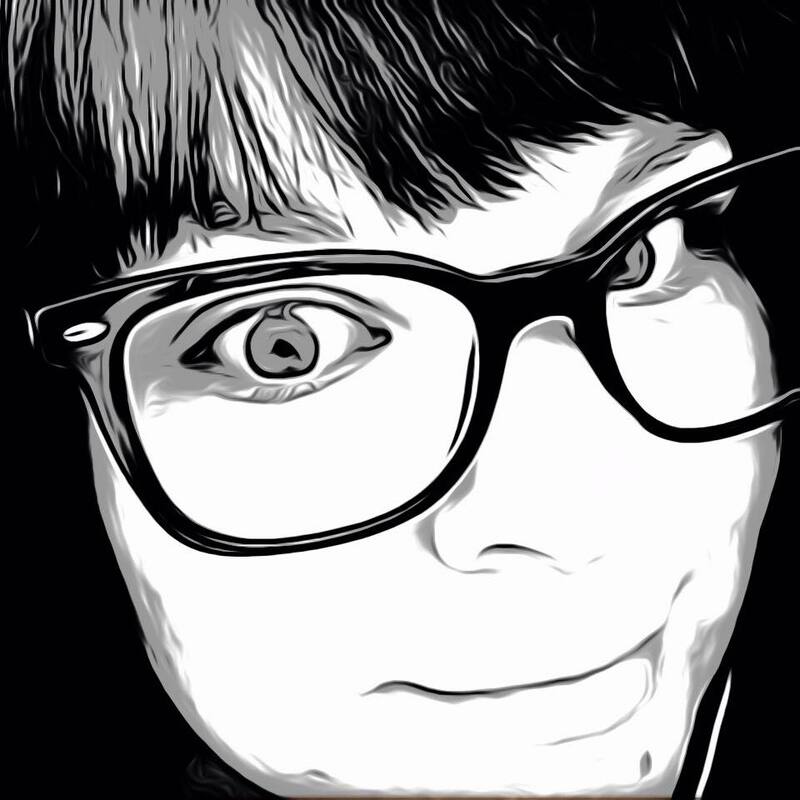 As fun as apps are, there is a serious side to the App Store. From helping with weight problems and smoking habits, down to emotional care, there are apps for everything out there. Not just for adults but children too. One difficult subject for any family to talk about with their kids is divorce. Kids and Divorce by eKel Ltd., wants to make that difficult transition a little less painful for the little ones. K&D is a unique kind of interactive animation App for kids and families going through divorce and different stages of family reorganization. 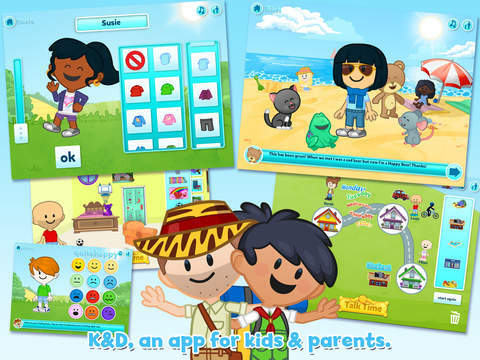 Designed for children aged 4-11 and their parents, K&D is fun to play; it uses a language of creative story making, providing kids and parents with a framework to explore feelings about family events. – AVATAR. Where kids begin by creating their own funky lookalike. – FEELING FACES. Show how everyone is feeling about family events. – MY FAMILY. Where kids can build a unique picture of all their loved ones. – KATY & DAN. Your chosen guides for exploring K&D. – PARENTS AREA. Describes for adults what each activity explores for kids. Playing with MR CROSS & MR CALM to learn how to chill out when cross. SAD BEAR will take kids on a journey so they can become happy again!! TALK TIME where kids and parents can share feelings about themselves. MY HOMES where kids create their own new house and bedroom. 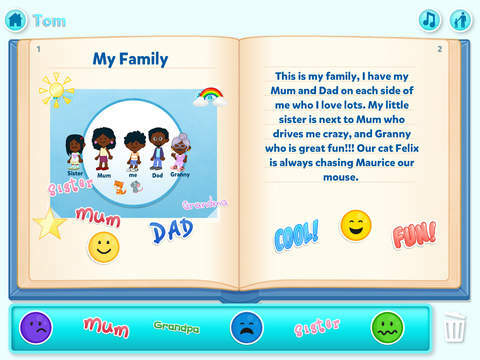 MY WISH TREES lets kids say the things they want to happen in their new life. Have fun as a family playing with K&D. It will let kids and parents show and share their thoughts and feelings about family events, improve communication between family members, and help everyone as they plan their new lives together. This app is optimised for iPad 3, iPad Air, iPad Air 2, iPad Air 3, iPad Mini 2 and iPad Mini 3. Kids and Divorce begins with a short video preview describing what the app is about, starting and opening up the conversation between parent and child about this new and upsetting situation. After the friendly intro, the user can set up their avatar, choosing clothes and characteristics that most feel like them. Other family members can be added as well, including pets. Different areas of the app let you explore and express more. One where a picture of the child’s bedroom can be created and decorated for each home. A map with the multiple houses to represent the seperate homes can be illustrated with features for their neighborhoods added. The idea is to express as much as possible through their eyes and creativity. There are also fun games to be played, like popping balloons, and cheering up Sad Bear. There are follow up questions after each segment for the adult to let the child clearly express how they are feeling during these activities. Feeling Faces are chosen at the beginning of each login and during the different areas. The pictures created can also be saved and added to an album where the child can describe what it is about and how they feel about what is going on. Kids and Divorce is well designed Family Steps app with creative and fun outlets for children to explore their feelings on the subject of divorce. The app is for children from 4-11 and is available only for iPad. It is currently $9.99 in the App Store. For more information about them and their apps, visit www.familysteps.net.